XR-5 was the material chosen to construct a cutoff wall to prevent any further contamination of the soil on the site of a former chemical manufacturing facility in Belgium. This paper details the improved constructability of a groundwater cutoff wall system at a contaminated site in Belgium. A high strength, flexible geomembrane was used in a bentonite-cement slurry trench in lieu of a thicker bentonite wall to contain contaminated groundwater and leachate. An additional bentonite-cement slurry wall and geosynthetic cap were also used to provide secure drainage and groundwater flow characteristics. The selected geosynthetic-based containment alternative provided a more environmentally reliable solution and produced savings of over 2 million Euros. Post construction monitoring has confirmed project success. Geosynthetics have gained acceptance over the last quarter as cost effective alternatives to traditional materials. Ease of construction coupled with often lower costs have shown these products to be vital to overall cost management. Further, geosynthetics usually offer improved performance features and improved consistency over traditional insitu constructed materials. This paper details the use of geosynthetics in lieu of traditional materials in an insitu waste containment area using vertical and horizontal isolation barriers. Insitu disposal of wastes often presents an economically viable long term option for waste management. Environmental effects are usually minimal and, in fact, may be less than "dig and dispose" methods. Cutoff walls have traditionally been used in water containment projects, where a cutoff wall serves as a waterproofing, or water barrier, feature. The wall contains the liquid inside some type of containment as shown in Figure 1. Similarly, in waste containment applications, the principal role of the cutoff wall is to prevent waste constituents from leaving a secure containment. The cutoff wall may also prevent intrusion into the waste containment area and with additional drainage features can be a dewatering or groundwater control structure. While cutoff walls along with any associated dewatering features are considered passive control techniques, they may incorporate some amount of active features, typically in the form of pumping of groundwater or leachate. Designers and constructors have used innovative combinations of these types of walls, typically driven by costs and/or constructability. Design constraints are usually construction related and the secure "keying" of the wall at the vertical limits and horizontal wall terminations. The location of many old waste disposal sites (floodplains, high groundwater, inconsistent or difficult geologic conditions) has also presented access challenges for construction of traditional wall systems. The project site is a closed chemical manufacturing facility in Grimbergen, Belgium. Grimbergen is a small town located on the northwest edge of Metropolitan Brussels as shown in Figure 2. The original site owner operated an agricultural chemical manufacturing facility which produced phosphorus and nitrogen fertilizers and pesticides. The plant began operation in the 1950's and ceased production in 1980. During that period, solid wastes were disposed in a section of the property using a simple continuous cut and fill technique. Buried wastes included various sludges and manufacturing byproducts contaminated during the agricultural chemical manufacturing operations. Wastes were disposed in excavated areas 7 meters in depth and were placed on an insitu base of natural clay. Local soils are composed of sandy clay with relatively high hydraulic conductivity. A perched water table as shallow as 1 meter is present over much of the site. Groundwater gradients in the area are low, but seepage into the adjacent canal was observed. The entire site, including both disposal and manufacturing areas encompasses 12 hectares, and is located near a canal, in a high-density industrial area. Figure 3 shows the disposal area from an adjacent road. The original chemical manufacturing facility was demolished around 1990 and the site was purchased by WATCO, a company specializing in commercial treatment of contaminated soils. With this purchase, the new owner also assumed responsibility for the disposal site and all contaminated plant areas. A soil treatment facility was constructed on site and has continued to be used to treat off site wastes on a commercial basis, producing non-hazardous product. The Belgium Federal Environmental Regulatory Agency, OVAM (Public Waste Agency of Flanders), required the owner to (1) Secure the waste site from off site contaminant transport and (2) Provide security from subsurface contamination as a result of operation of the soil treatment facility. The proposed containment solution is illustrated as "Initial Project" in Figure 4. The 60-cm bentonite wall was to be constructed by open excavation. The dewatering system sought to lower the water table in the fill relative to the ambient water table, forcing flow into the contaminated area. This system as to be composed of corrugated pipes installed by deep excavation directly through the fill. This entire containment solution was estimated to cost 10 million Euros. 22-cm Bentonite-cement slurry/Geomembrane cutoff wall. The geomembrane cap consisted of a water drainage pipe/geotextile system sandwiched between double geomembranes. This same pipe/geotextile system was placed over the fill, under the geomembranes for gas removal. One meter of backfill was placed over the top geomembrane to facilitate vegetation. Note on Figure 4 that an additional layer of pipe/geotextile is placed within the fill. Because of variability in the hydraulic conductivity within the fill, this drainage feature was used to ensure distribution of trapped water, preventing mounding. A 22-cm bentonite-cement slurry wall was placed from the ground surface to the bottom clay layer. A geomembrane was inserted vertically in the center of the slurry. Construction of the wall is discussed later in this paper. The geomembrane was welded at the top to the lower geomembrane cap, creating an encapsulated fill. A finite element analysis revealed that the combination bentonite-cement/geomembrane wall provided a mean k value of 10-12 cm/sec over the entire site wall. Post construction water level monitoring showed increased water levels in the containment area. It was concluded that a natural breech existed in the bottom clay containment layer. The proposed solution consisted of a second, interior bentonite-cement slurry wall, with a drainage system between the two walls. This wall was estimated to have a mean k value of 10-10 cm/sec, resulting in a net outflow to the drainage system. Initially the contractor experimented with Geosynthetic Clay Liners (GCL's) as a capping alternative, but experienced inconsistent installed quality and reliability. 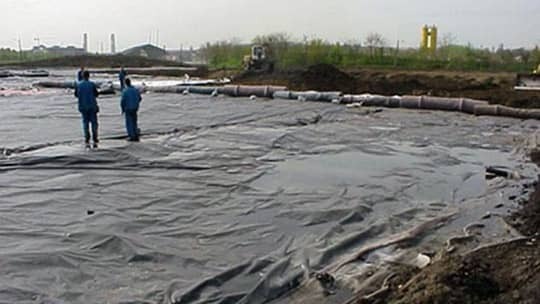 Subsequently, the owner demanded a geomembrane for the capping project. A high tensile, high modulus geomembrane was required for this application, particularly for the cutoff wall due to the stress involved in installation. Subsidence was expected to be negligible so low elongation properties were favorable. The ability to withstand sustained loadings, puncture, and resistance to a wide variety of pollutants was necessary. Resistance to temperature swings was important during installation, as was flexibility. The specified material was a Reinforced Ethylene Interpolymer Alloy (R-EIA) and the selected material was 8130 XR5, manufactured by Seaman Corporation, Wooster, Ohio USA. The capping and cutoff wall construction took place simultaneously. Prefabricated panels of geomembrane, up to 1400 square meters in size were deployed for the cover, in an ultimate layout as shown on Figure 5. Figure 5 delineates the experimental GCL area. Also, an additional geomembrane layer was used under the soil treatment plant area per direction of OVAM. These panels were welded together using hot wedge equipment. Figure 6 illustrates cap construction and Figure 7 shows channel construction in the fill to facilitate gas/water drainage via the pipe/geotextile components. Figure 8, Figure 9, and Figure 10 show the cutoff wall construction. A special trenching machine with a cutting saw on a gliding framework was used to install the bentonite-cement wall, without open excavation. The bentonite-cement was mixed at a plant on-site and the mixture included special additives to give improved plastic qualities. A second machine (Figure 11, Figure 12, Figure 13, and Figure 14) was used to install the geomembrane. Attached to the leading edge of a knife-like instrument, the geomembrane was pulled into the slurry and then released using vibration combined with bentonite-cement slurry pressure from the center of the tool. The membrane was pressed into the bottom clay layer. These two machines were designed specifically for this project and represent an innovation in groundwater cutoff wall technology. The geomembrane was installed in sections 7m deep and 3m wide, and overlapped in the slurry 30 cm. The mean k value calculation included the torturous 52-cm hydraulic path through this overlap. All geomembrane activities were subject to a Construction Quality Assurance Plan which included source testing, destructive and non-destructive seam testing and was approved by OVAM. Off side monitoring wells, piezometers and groundwater levels across the site profile are used to verify the success of the project. To date, the geosynthetic alternative has proved to be a financial and technical improvement over the originally proposed project using natural materials. Reprinted from Proceedings, Seventh International Conference on Geosynthetics, Nice France, September 2002.